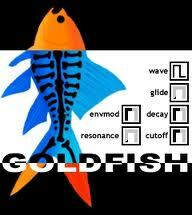 I built the original Goldfish synthesizer as a tiny plugin for a sequencer system running on WinCE PocketPC devices (see here). Sadly, this platform has not survived the test of time. A new hardwore platform is under development to rescue the synth and some of its descentdants. a decent audio output that is not TOO noisy. WE DON’T NEED NO THREE OH THREE – WE’RE AS ACID AS CAN BE!